This is 30-30 Win. 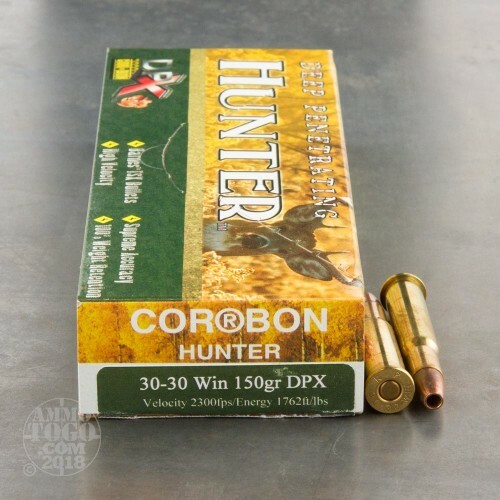 Corbon DPX 150gr. Hollow Point Ammo. This ammo is manufactured by Corbon using Barnes Triple Shock X-Bullets. Corbon products have earned a distinctive reputation in the industry with their high energy JHP ammunition. 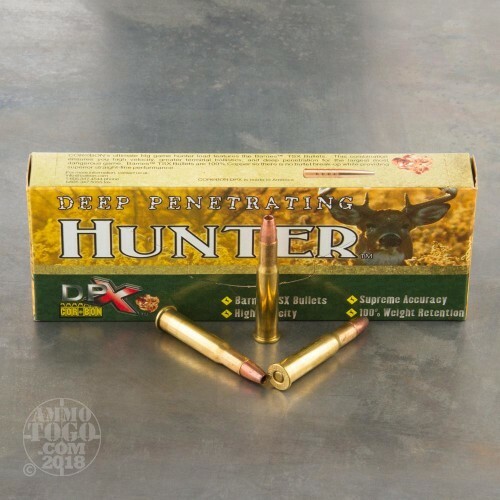 They maintain that standard with this new DPX line, it has a deeper penetration and rapid controlled expansion to make it the optimum load for Hunting. The Barnes Triple Shock X-Bullet is a solid copper projectile and heat treated for extra toughness. There's no separate jacket and no lead core to seperate. The bullet holds together for deep, dependable penetration---every time! A deep forward cavity causes the nose to peel back in four separate, razor-edged petals. Viewed head on, the appearance of these four petals gives the X-Bullet its name. In 2003, Barnes introduced the Triple-Shock X-Bullet. Identifiable by rings cut into its copper body, it offers all the qualities that have made the X-Bullet a favorite of knowledgeable hunters everywhere. 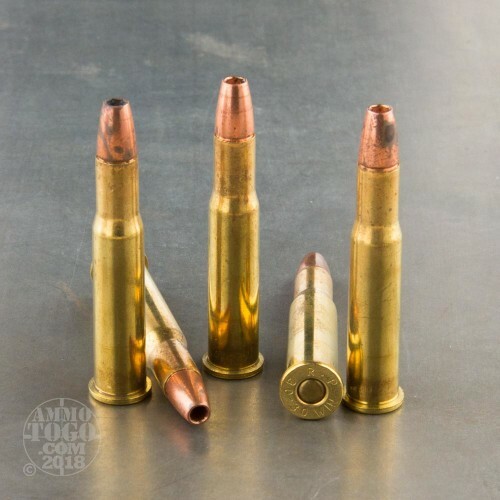 Like the X-Bullet, the Triple-Shock X-Bullet features all-copper construction, no fragmentation, maximum weight retention and 28 percent deeper penetration than the best lead-core bullets offered. On impact, the bullet face opens to create four razor-sharp cutting edges. The new Triple-Shock X-Bullet provides significantly greater velocities, lower pressures and less fouling, without requiring an external coating. The bullet delivers a triple impact! One, when it first strikes the game, Second, as the bullet begins opening, and Third, a devastating impact when the specially engineered cavity fully expands to deliver extra shock with maximum transferred energy. Barnes' revolutionary Triple-Shock X-Bullet design provides all the benefits of the time-proven X-Bullet. In addition to greater velocities, reduced pressures and less copper fouling, the Triple-Shock X-Bullet delivers a three-punch impact that's deadly on game. 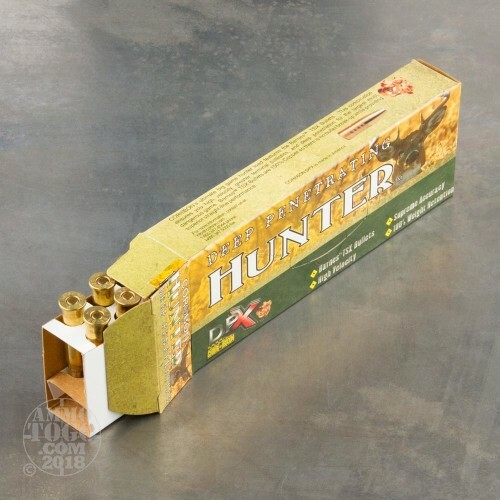 This ammo is the most devastating and deepest penetrating ammo you can buy in a factory load. This ammo is brass cased, boxer primed, non-magnetic and non-corrosive. It comes packed in 20rd. boxes. Muzzle Velocity: 2300 fps.